“I know what you're thinking. Did he fire six shots or only five? 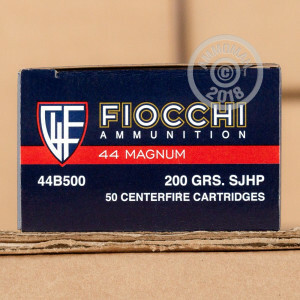 This 44 Magnum cartridge from Fiocchi features a 200 grain projectile, which is a light load for its caliber but in no way wanting in power thanks to its very fast 1,475 fps muzzle velocity. 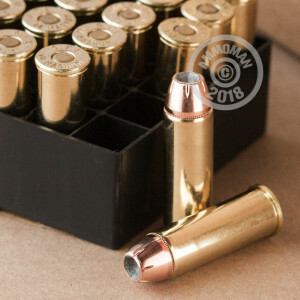 This bullet’s partial jacket serves to prevent lead fouling in the bore, facilitate in penetration, and help control the rapid expansion provided by the hollow point over a wide range of velocities. Its bullet’s capacity for expansion suits this cartridge as well for self-defense as it does for close-range deer hunting. As a Fiocchi, this round features first rate components that assure its reliable performance. 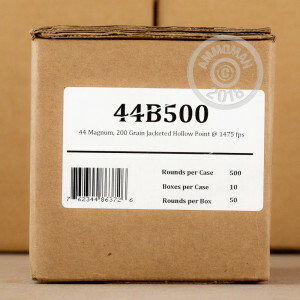 Its non-corrosive Boxer primer means you won’t have to figure out right away just which 500 things you’re going to shoot, and its factory fresh brass casing can withstand multiple handloadings. Fiocchi has certainly learned their craft over the past 14 decades.